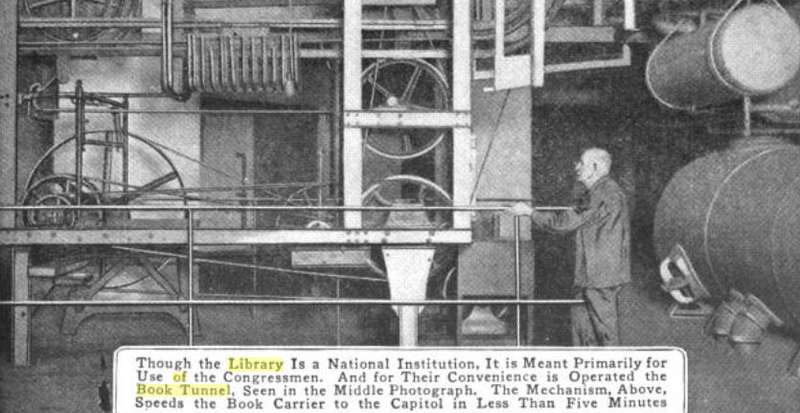 Most people who work in the U.S. Capitol don’t know about the 100-year-old book conveyor tunnel underneath them that used to connect the building to the Library of Congress. It’s long since abandoned, but it’s still down there. A key selling point for the new library was the quarter-mile long underground book tunnel linking the two buildings. A state of the art conveyor system ran the length and could whisk books back and forth at 600 feet per minute. Designed by the Miles Pneumatic Tube Company in Boston, the electric “book conveying apparatus” pulled large trays in an endless loop along a rail system set into the wall. As the trays approached the Capitol’s basement, they traveled up three stories into a small receiving room near the House floor. The entrances to the tunnel were bricked up years ago, but the 100-year-old apparatus is still down there to this day. Capitol Hill has lots of weird legacy systems like this. Historical preservation multiplied by bureaucratic inertia dictates that even when piece of technology is abandoned, it is never fully removed. The House of Representative offices all still have mail chutes built into the walls (now sealed up), and the room under the Senate that used to house marble bathtubs now doubles as a boiler room. The Capitol still has its rows of telephone booths, but without the telephones, and the book tunnel room in the Library is now full of servers.